The Numark NVII reimagines the hardware-software experience for the professional DJ. Improving on the superior performance of the original NV, the NVII features an upgraded layout with clear markings for fast, responsive operation. This article will answer some of the common questions about the features and functionality of the Numark NVII. What is new with the NVII? Is the NVII class complaint? Do I need to install a driver? What size are the platters on NVII? What size are the display screens on NVII? Does NVII require a computer? Are there volume, and crossfader slope adjustments? What preferences need to be set in order use NVII with the laptop closed? Does NVII work with Virtual DJ, Traktor, and other DJ programs? What is the onboard sound card of NVII?What is the onboard sound card of NVII? What type of pads are on NVII, and are the velocity sensitive? Is the full version of Serato DJ included with NVII? Are the knobs touch sensitive? Does NVII require a power supply or will it work off of USB Bus power? 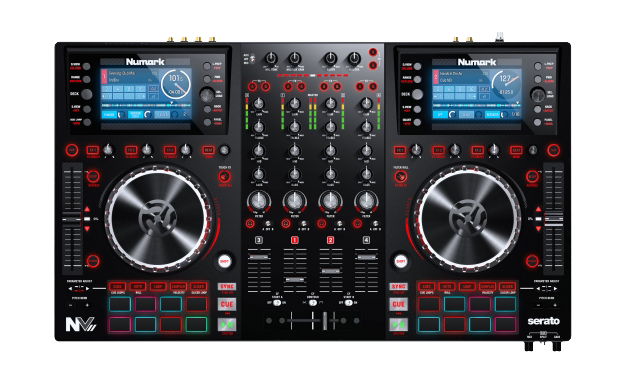 Where can I learn more about the Numark NVII? The NVII is a class-compliant device on a Mac. Drivers are available for Windows PCs for optimal performance and can be downloaded from the product page or directly from this link. NVII has dual 5-inch hyper-responsive platters with search and scratch modes. NVII has dual 4.3-inch full-color displays which provide 1:1 real-time visualization of Serato DJ. NVII supports Mac OS X 10.8 and higher, and Windows 8 and higher. Does the NVII require a computer? Yes. The NVII is a Serato DJ controller and requires that Serato DJ is running on a compatible computer. Are there volume and crossfader slope adjustments? Yes! The NVII has a CF Contour Switch, and you can adjust the level in the Serato DJ preferences. In order to use NVII with a closed laptop, you will need to ensure that your computer does not automatically go to sleep or hibernate when the laptop is closed. For Mac we recommend using "Caffeine" and "NoSleep". On Windows computer you can simply adjust your power settings. Also, you can refer to this link for instructions on how to DJ with your laptop closed. NVII has been developed from the ground up as an amazing controller for Serato DJ. Numark and Serato have carefully tuned and mapped each control to create the best possible out-of-the-box user experience with the included Serato DJ software. However, since NVII's hardware controls appear to your computer as a generic MIDI device, it can indeed be custom-mapped to any other DJ application that supports user or developer-created custom mapping. A note about the NVII's onboard screens: They were designed expressly for use with Serato DJ. In most situations, only the knobs and sliders will work other software applications that can be easily mapped to NVII. One notable exception is Virtual DJ, which has managed to figure out a way to send data to the NVII screens as of Virtual DJ 8 Build 2174.951. While the graphic elements onscreen will look exactly as they do when the NVII is used with Serato, VDJ 8 users are now able to take advantage of the NVII’s screens, as well as the rest of its functionality. Users of Virtual DJ will of course need to configure the audio portion to use the NVII audio seamlessly. What is the on-board sound card of NVII? NVII has a built-in professional grade USB 2.0 audio interface. What type of pads are on NVII, and are they velocity sensitive? NVII has 16 velocity-sensitive trigger pads with backlit RGB feedback, 10 pad modes for hot cues, loop slicing, and sample triggering. Yes. NVII unlocks the full version of Serato DJ. Yes. NVII has intelligent touch-activated knobs that provide groundbreaking control of filters, EQ and more. Does the NVII require a power supply or will it work off of USB bus power? NVII requires a 12V DC 2.0 Amp pin-positive power supply which is included with the purchase. Third party manufacturers tend to make and create cases that are for or fit well with many Numark products. The first place we most often recommend looking is http://www.odysseygear.com/ The dimensions of the Numark NVII are: 21 3/5" x 13 2/5" x 1 4/5" (L x W x H). For more information be sure to check out our NVII Knowledge Base for more guides and videos, or check out the DJ Shortee NVII tutorial.